Since the most component of basalt is silica, it’s fairly solid which is higher than granite, limestone, sandstone and shale. For basalt crushing, you need to choose jaw crusher as primary crushing. SBM jaw crusher offers versatile solutions for basalt crushing looking to optimize its crushing productivity. Apart from primary crushers, you can find secondary crushers or tertiary crushers here. CS cone crusher whom you can choose as secondary basalt crushing equipment is durable yet economic. If you need higher capacity, there are HPC cone crushers for your choice. 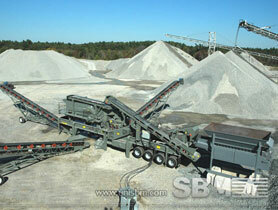 Apart from stationary quarry plant, there are new and powerful mobile crusher plants for portable basalt crushing. By adopting computer-controlled system, it offers an amazing crushing capacity and good working environment. In the normal running of basalt crushers, you just need some simple check and maintenance work to make sure it in good state. Actually SBM will send professional engineers to ensure that everything works together in the best possible way. As a Basalt stone crusher machine manufacturer in China, SBM can offer jaw crusher for small or large basalt crusher plant, impact and cone crusher for fine crushing, mobile cruhser used as complete basalt crushing plant. "SBM basalt crushers is combined with special high-quality cast steel components and durable wear parts, with exceptionally high crusher availability, cost-efficient crushing and low cost per ton. "